Whether your bike’s a modern marvel or a cult classic, when it’s time to replace the freewheel, the .. Designed to remove the four-notches freewheels from BMX, this Freewheel removal tool is easy to use,..
Old School BMX ACS Crossfire Removing Tool by ACSThe Crossfire Removal tool suits all Cros.. These are the same design, materials and price as CROSSFIRE, but use a standard 4-prong removal tool.. These are replacing the CROSSFIRE PRO & PRO 1.5 freewheels. CNC wire cut steps and pawls, seale.. 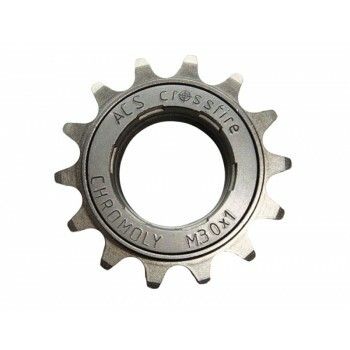 The ACS Crossfire Pro 1.5 freewheel is made from cold forged chromoly with nickel plated 3/32" teeth..
Old School BMX Chromo 13T Crossfire 3/32" sprocket by Acs- Cold forged, rather than hot forged c..